The salon has seen a diverse crowd of late as we have welcomed dying composers, ambitious engineers, cricketing rogues and celebrated salon-keepers. Today we welcome a gentleman of the law, respected by the public for his political decisions and ultimately one of the men who would defend King Louis XVI when he went on trial for his life. Guillaume-Chrétien de Lamoignon de Malesherbes enjoyed a life rich with opportunity and achievement yet ultimately met a a tragic end, following his loved ones to the National Razor. Malesherbes was born into an illustrious family already steeped in the legal profession and there was never any question of the business he would go into. His early career was sparkling and before he turned 30 the young lawyer succeeded his father, Guillaume de Lamoignon de Blancmesnil, as President of the Cour des Aides and Directeur de la Librairie. In this latter role he was responsible for the censorship of printed material and moved in the highest literary circles, mixing with the likes of Diderot, with whom he would enjoy an enduring friendship. 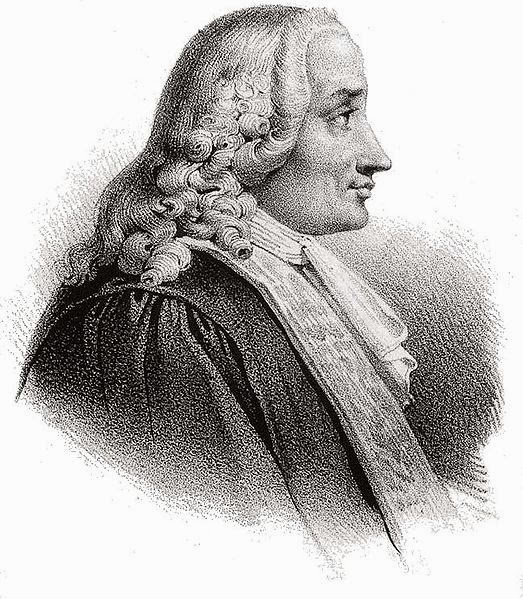 A champion of the Enlightenment, Malesherbes played a large part in the publication of Diderot's Encyclopédie, ou dictionnaire raisonné des sciences, des arts et des métiers. However, the legal and literary worlds proved less of a challenge than Malesherbes had hoped and in 1771 he took a step into politics, speaking out against a schedule of reforms that the king had tabled. This put him in direct opposition to the highly influential and absolutist Maupeou, who immediately moved to block Malesherbes, eventually succeeding in convincing the Louis XV to exile him to his country estate where he could do no harm. When Louis XVI came to the throne he swept away Maupeou and his followers and Malesherbes was returned to his role in the Cour des Aides. In 1775 he was made Secretary of State for the Royal Household and campaigned against corruption in local authorities, winning public respect for his actions and policies. He became a champion of penal reform and regulated the use of the much abused system of lettres de cachet. However, his increasing interest in the rights of French Protestants found no favour with the king and Malesherbes eventually decided that he had spent long enough on matters of state, deciding that the time had come to spend a little time indulging his own interests. When Malesherbes retired in 1776 he spent some time travelling Europe and furthering his love of the natural sciences, also finding time to write and speak on the subject of Protestantism. However, after a decade of peaceful retirement, Malesherbes found himself back at court when the king gathered his most trusted and valued allies to him in order to seek their guidance on matters of government. Despite his uncertainty about leaving his peaceful retirement Malesherbes accepted the position of advisor but, troubled by the increasing unrest in the country, he eventually returned to his estate and resigned his position. However, his loyalty to Louis came to the fore when news reached Malesherbes of the king’s arrest and he left his peaceful life to join the king’s defence team alongside Raymond Romain, Comte de Sèze. Of course their efforts were to be in vain and Louis went to his death in January 1793. At the end of that year, Malesherbes and his family were also arrested and sentenced to death as enemies of the new regime. As the elderly man watched, his daughter and grandchildren were executed before he followed them to the guillotine, the last act of an eventful life. Once again, it shows how dangerous these times were and how wise you needed to be in making your associations and connections. How awful to watch your entire family being executed before you! Indeed; a particularly sadistic punishment.